The Hinkley Brighton 3 light solid brass outdoor pedestal lantern in Sienna bronze finish is rated IP44 and features vintage style and seeded glass panels. Boasting a circular mount and short stem and upright lantern on four flat curved mounting bands, with sloping hexagonal roof with finial, flared lower and clear seedy glass panels. Criss-cross window bars and central medallion make the seedy glass panels stand out and the three candle style lights give bright all round illumination. If you are searching for a quality gate post lantern in a classic style, this one from the Brighton suite should be considered. Fully weatherproof and supplied with a manufacturer’s limited lifetime warranty, which relates to the corrosion of finishes on lights like this one. Exterior fittings must have an IP (Ingress Protection) rating which indicates the fittings ability to prevent solids and liquids penetrating the enclosure. The higher the number, the greater the protection. The minimum rating for an outside light exposed to the weather is IP23. This post light is rated IP44. This replica light is supplied by Elstead Lighting and designed in the USA by Hinkley, founded in 1922 in Cleveland, Ohio. 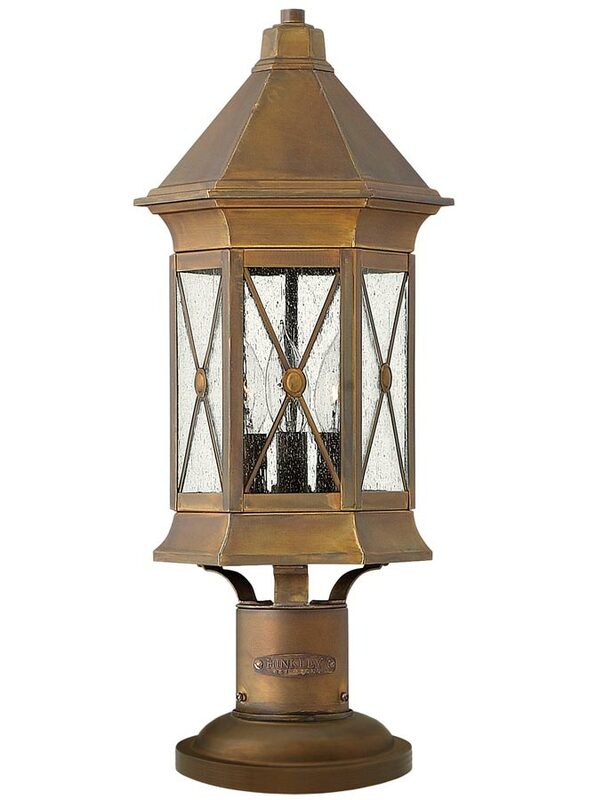 They have transformed from a small outdoor lantern company to a global brand intent on bringing you the best in style, quality and value designs like the Brighton 3 light solid brass outdoor pedestal lantern in Sienna bronze finish and rated IP44 featured here.